This high quality outdoor vinyl decal features the Bullet Logo in individual lettering so it does not impair your vision when using your rear view mirror. This Decal is available in several colors and is approximately 14" x 3.5", just a little bigger than a regular bumper sticker. Metal License Plate with reflective Chrome and Black Bullet Logo on Colored background. Please choose colors from below. This high quality outdoor vinyl decal features the Bullet Logo in individual lettering so it does not impair your vision when using your rear view mirror. This Decal is available in several colors and is approximately 19" x 5"
This quality aluminum license plate tag features raised embossed letters to achieve a 3D effect and comes in black with silver letters or silver with black letters. 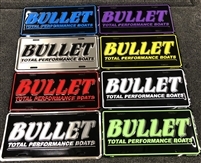 This versatile decal is found on the bow stop of all Bullet trailers, but is also commonly used on Sportsheilds and Back Splashes and Rear Truck Windows. All outlined in chrome and black border. Please prep surface with RUBBING ALCOHOL, --------NOT ACETONE------- Prior to mounting.